Before you leave Glenfinnan and as you pass under the arc of the viaduct, it's worth taking a moment to savour this wonderful location. The viaduct and monument guard the head of the loch and for once human endeavour and the wild landscape seem strangely at peace. The viaduct has been made famous of late by its appearances in the Harry Potter films. Built by Sir Robert McAlpine between 1897 and 1901 it forms part of the Mallaig extension of the West Highland Line. 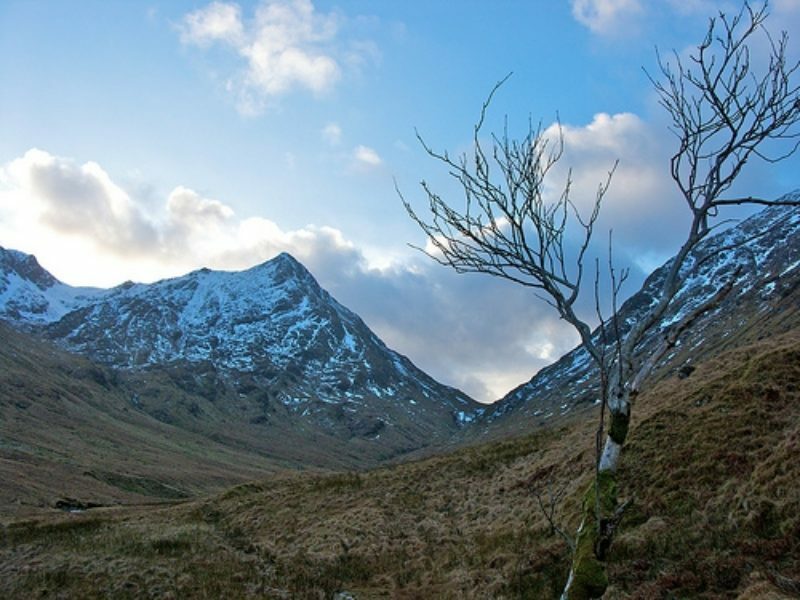 Connecting Fort William and Mallaig, the line was a crucial artery for the local fishing industry and the highlands economy and is considered to be one of the most picturesque train journeys in the world. Passing beneath it marks you first steps onto the trail proper towards the rough bounds of Knoydart. Glen Finnan itself is stunningly beautiful, although it has been rather spoilt by a new hydro-electric scheme and it will be many years before the landscape properly recovers. As you descend Gleann Cuirnean, the path becomes steadily rougher and there are a few scrambles where the river has eroded it away. On balance it's better to keep at first to the west side of the river and look to cross before it heads into a steeper sided ravine heading to the larger River Pean. Even the tributary is a decent size so should be crossed with caution in spate. For more details see this video. There is a proper bridge over the River Pean after which you should turn west for a few hundred metres and look for a path north into the woods. The path here is initially very boggy with some thigh deep spots to watch out for (there is now sign warning you away), but with a bit of care you'll soon reach a forest track which takes you round into Glen Dessarry, on what is a deceptively long slog along a forest road. The bothy at A'Chuil makes an ideal overnight stop. There are also camping spots by the River Dessarry. If you are fit and strong you could push on towards Sourlies but that would be a really long hard day. 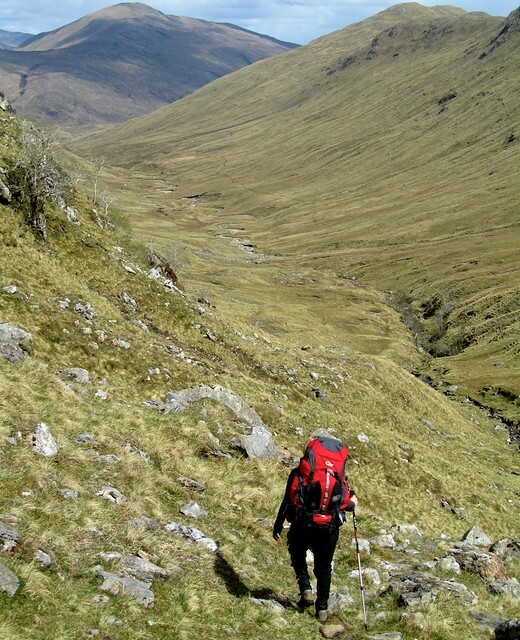 A route heads north from Drumsallie at the head of Loch Eil north up Gleann Fionn Lighe, climbing to the bealach of Gualann nan Osna before traversing Gleann Camgharaidh and descending into Glen Pean. This alternative is worth considering if you choose the Loch Eil side alternative to the first leg.